The conference on energy crops held in Tremp (Lleida ) and organized by the Centre Tecnològic Forestal de Catalunya (CTFC) (Forest Technology Centre of Catalonia) in collaboration with COMSA EMTE, the local council and Forestal Catalana, served to present the results of a poplars plantation for biomass production and approve its viability in consideration of future exploitation. Biomass is obtained primarily from agricultural crops and forestry products waste. However, there is not a biomass market that might ensure expected supply, and this is the reason why energy crops are being encouraged. This means to cultivate agricultural or forestry products uniquely aimed at biomass production, and thus ensure supply. Thus, the session was intended to widespread the production results of the poplar plantation located on the property of l’ Espona in Pallars Jussà municipality. This is a pilot project that started in 2010 with the aim of studying the feasibility of these trees for biomass generation. 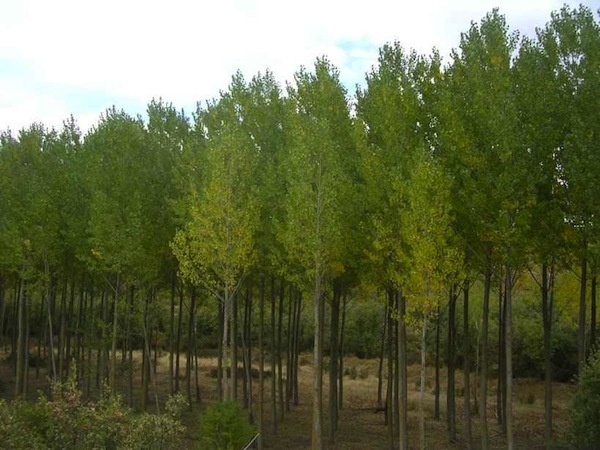 Three different clones of poplar were cultured in the plantation of which one has proven to be viable for energy recovery through biomass boilers (heat). COMSA EMTE was one of this project’s initiators. During the day, COMSA EMTE Medio Ambiente’s director of Engineering, Technology and Generation, Albert Solé, welcomed the results of the culture and showed his intent to use poplars to generate biomass at the plant jointly managed by his company and Abantia in Les Borges Blanques (Lleida ). It is a world pioneering plant that combines solar thermal and biomass energy. The day began with a series of presentations by technical experts and representatives of the organizations involved in the project. It was completed with a visit to the land, where attendees were able to know in detail the processes of cutting, collecting and stacking trees. Energy crops are still nothing more than forest or agricultural crops, but are implemented and operated for the sole purpose of obtaining biomass. The essential advantages of these crops are the predictability of their availability and the spatial concentration of biomass. In fact, woody crops (poplar , willow … ) and grasses ( sorghum , cereals … ) of short rotation for thermal applications (heat and electricity) are being developed in some countries in central and northern Europe and are now being tested in our country. But not all sectors are in favor of energy crops. Environmental groups like Greenpeace do not support every system for biomass production. Instead they propose that a very limited use is made to occupy the minimum territory for energy crops. Oxfam is another NGO who is not in favor of what they call unsustainable biofuels and NGO Transport & Environment considers it as a bad biofuel because it entails increasing deforestation and increased pressure on food prices. As we already reported member countries do not reach an agreement on the percentage of biomass that should come from energy crops, which is currently at 5%, as some like Lithuania propose to increase it to 7% while others such as Sweden and Finland are demanding a much lower percentage.